A couple of years ago Alan Baylis, a member of the Bees, Wasps and Ants Recording Society (BWARS), contacted me about this site. He had been recording bumblebees there for some time and found most of the species expected in lowland Britain, the exceptions being the great rarities such as the Shrill Carder Bee Bombus sylvarum. This concentration of bumblebees suggested an equally rich site for other hymenoptera and such proved to be the case. 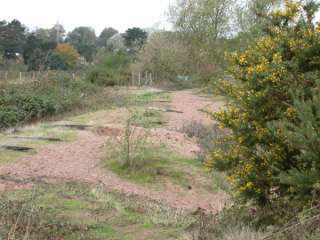 Cherry Orchard lies on the east bank of the River Severn just south of Diglis Basin, Worcester, and can be classed as a brown field site, situated as it is between housing estates and light industrial units. 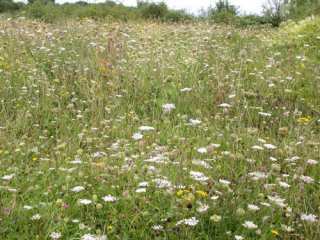 Part is a mix of scrub and herb rich grassland bounded on the south by strip of woodland and the Duck Brook. This area has been designated as a nature reserve by Worcester City Council. A smaller area close to the Severn is owned by British Waterways and has been used to dump material dredged from the river. 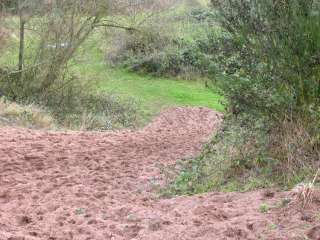 On drying this has produced a system closely resembling sand dunes or sand heath and an unusual flora and fauna has developed. Members of the Worcestershire Recorders’ Committee made two visits during 2005, on 18th June and 27th August. Many of us were previously unaware of this most unusual site on our door-step and recording produced a set of records clearly demonstrating its local, if not regional importance. Perhaps most surprising was finding of species generally considered to be largely confined to coastal sand and sand dunes, such as the beetle Notoxus monocerus and the leaf-cutter bee Megachile maritima with its parasite, a cuckoo bee, Coelioxys conoidea. Several other local and notable species were found and are indicated on the species list. Cherry Orchard clearly demonstrates the biodiversity value of brown field sites which should not be automatically marked down for housing or industrial development. The nature reserve designation by Worcester City Council is to be applauded. We hope to continue recording next season and confidently expect a significant extension of the species list. As a hymenopterist, I am aware that 2005 has not been good for many species in this group and Cherry Orchard has the potential to provide habitat for many that were not located during our visits. Also, a visit earlier in the year might pay dividends. On 27th August 2005, when we made our second visit, the weather was less than ideal and a repeat at this sort of time in better conditions should be more productive. I would like to thank Worcester City Council and British Waterways for permission to collect on their land.